I’ve long been a fan of that Tiger Woods Nike commercial where he bounces a golf ball around and then hits it off straight down the course. Both because the simple way it’s filmed is cool and the fact that Tiger Woods is awesome with golf stuff. To illustrate his point, he recalled a commercial he was shooting for Nike in the late 1990s starring golfer Tiger Woods. Liman noticed Woods bouncing a ball on the edge of a club during breaks from shooting. Liman grabbed a shoulder-held camera and, away from the crew, asked Woods to bounce the balls while being filmed. Liman began to lose his patience when Woods blew the shot several times. “I told him, ‘I can’t believe that of all people you are choking under pressure,’” Liman told the audience. Woods glared and then bounced the ball while transferring the club through his legs behind his back and finished by smacking the ball in mid air. The shot, which became a classic, was natural, unrehearsed, and driven by imagination rather than millions of studio dollars, Liman said. For the Joe Torre Haiku Contest. So the Knicks won last night. It was a good game. 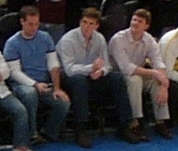 My seats weren’t nearly as good as Eli‘s here, but I sure can’t complain about the price. I’m going to be at tonight’s Knicks game. I just entered one of those contests my school was having, and I won a free ticket. I’m bringing the camera, so be sure to check back for some pictures. Now, I’m a big fan of baseball. It’s my favorite sport. I love to play, and I love to watch. 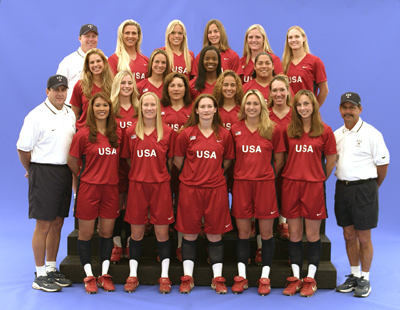 On ESPN this evening, they were showing a USA Olympic team softball game played on July 13th. I couldn’t help but notice the incredible athleticism. I also could help but notice that some of them are pretty good looking. I thought that was kind of cool. I’m watching the Major League Baseball All-Star game. Best part: Muhammad Ali. Here’s how it went down. Two kids from the Boys and Girls Club are to throw out the ceremonial first pitch. Ali comes out with two baseballs to give to them. Ali starts pretend-boxing with one of them, then the camera. He then stands to the side as they throw to Lance Berkman and Derek Jeter. Jeter and Berkman then come out to the mound and give the baseballs to the kids. Then they both pause for a photo op with Ali and the kids. Ali starts pretend-boxing with Jeter. Jeter kind of pretends to run away from him. Jeter then calls both teams over from where they are all standing behind the mound, and they gather for a group photo with Ali. Alex Rodriguez and Luis Sojo kneel in front of the group. As the photo is taken, Ali gives Rodriguez the ‘ol bunny ears. Hilarious. He is The Greatest. I just remembered: the Tour de France starts today. I’m rooting for my pal Lance Armstrong. I love that recent commercial he did. You can see it here here. Looks like he’s on a recent cover of Sports Illustrated too. Here’s the article. And while we’re on sports, how about Derek Jeter’s play the other day? See it here.